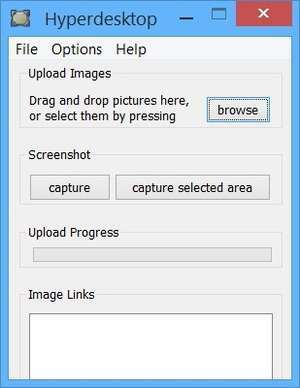 Hyperdesktop is a small and lightweight image capturing tool which takes snapshots of an area of your desktop and can then upload them to the Imgur image hosting service. The program is tiny and portable; That means you can run it from virtually anywhere after having installed the executable files. The main interface of the program sports a couple of options including the option to only capture a certain area of your desktop or the entire screen. Capturing areas of the desktop allows you to select any area of your desktop. Version 7 is a freeware program which does not have restrictions and it's free so it doesn't cost anything. For security reasons, you should also check out the Hyperdesktop download at LO4D.com which includes virus and malware tests. Additional screenshots of this application download may be available, too. 3 out of 5 based on 70 ratings.